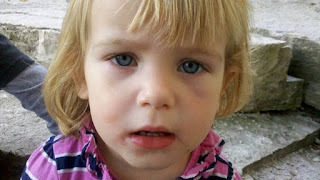 Peyton's first black eye was compliments of her big brother. On Tuesday, they shut down school early because the secret service shut down the street the school is located on due to the impending arrival of Michelle Obama. So I picked up the kids early and thought we'd have a fun afternoon at the Nature Museum. The kids loved the butterfly exhibit and all the "stuffed animals" like the polar bear, owl, bunny in the fox's mouth and the lynx. However, their favorite part was this room that had a slide in it. Austen kept telling Peyton get on my back! What he really meant was get behind me and wrap your legs around me and we'll go down together. I told him to just go down himself and quit bothering his sister. She was going to go down the way she wanted to go down. But he somehow got her to wrap her legs around him and off they went...sliding to the bottom, where they landed on their butts on the soft mat and smacked heads - the back of Austen's head to Peyton's eye. But Peyton is a tough cookie. She cried for maybe 30 seconds and got right back up and went down the slide (although not with her brother). Here is my little trooper right after and then the next day. 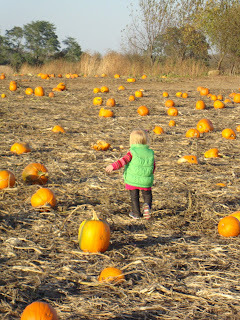 The last two weekends we have taken advantage of the warm weather and headed off to two different pumpkin farms. The first pumpkin farm is one that Tom and I have been going to for years even before Austen was born. Austen and Peyton got to run around the farm, go on a scary hayride (Austen was more scared than Peyton but not scared enough to miss it). 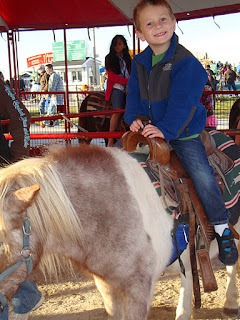 Austen rode a pony. Peyton said she didn't want to go. They ate kettle corn, picked out pumpkins and played on the slides at the farm. Here's a summary in pictures of our day at Goebbert's. This past weekend, we joined friends and headed to Stade's Farm and Market. It was a different experience than Goebbert's. Austen and Peyton went on this one ride that I remember Austen loving as a little kid and Peyton loved it too....so much that she went on it twice! Peyton also made her first appearance in a bouncy house. At first, she wasn't so sure but soon she got into jumping around with her brother and friends. 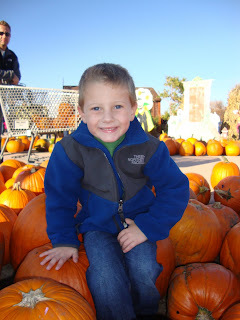 We took a hayride out to the pumpkin patch where you could pick your own pumpkins - we came home with two more. Austen rode some dirt bike and a pony and this time Peyton ventured to ride a pony too. We ended the day by taking the kids to "Old MacDonald's" as Austen calls it (aka McDonald's). Here's a summary in pictures of our day at Stade's. 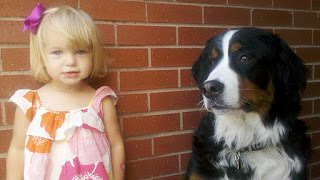 So I am on this Yahoo Groups list for owners of Bernese Mountain Dogs. People post questions, information about the breed and useful tips. I receive maybe two or three emails a day and I enjoy glancing over the many topics and educating myself even more about our beloved breed. This past week a name posted in one of the subject line's happens to catch my eye. It was Tallpine's Typhoon Bedmark (call name -Ty). The name rings a bell because it's Adler's dad. I click on the link only to learn that her dad died on Tuesday. He was 11 1/2 (almost 12). 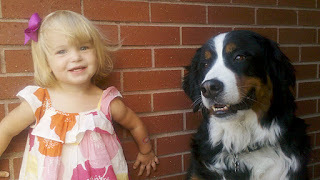 That's actually good news for Bernese Mountain Dogs whose life expectancy is 7-9 years. I feel hopeful that Adler will have a longer life expectancy than most Berners. That was short-lived though as I was searching for more information on Adler's mom Brighteye's Shooting Star (call name - Hayley). She lived only 7 1/2 years. Adler turns 7 next month. I can't believe my Brighteye's Devil in the White City (call name - Adler) is in the golden years of her life already. Forever still wouldn't be long enough to have her. So to get in the Fall spirit this weekend we decided to take a drive to one of our favorite states (Michigan) and pick some apples. The almost 80 degree weather didn't help get us in the Fall mood but the changing leaves, already brilliant in their red, yellow and orange hues, made the drive scenic. 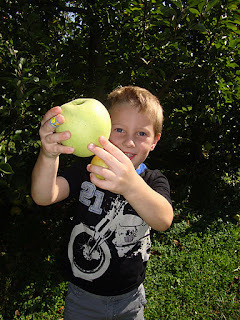 Austen quickly got into apple picking mode. We had to slow him down or we would have gone home with a whole bushel. Peyton wasn't so good at getting the hang of pulling them off the tree, however, she did like throwing them in the wagon. We just had to watch that she wasn't picking up the ones off the ground and having us buy those! 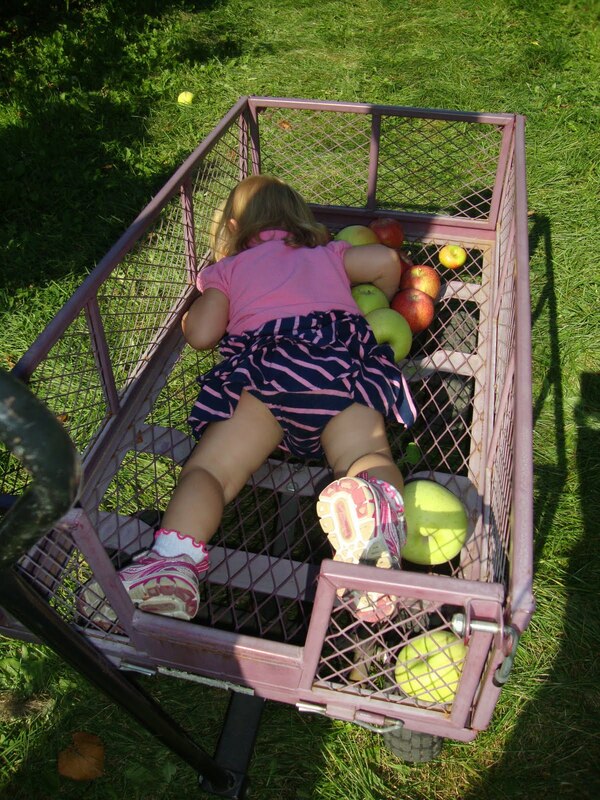 During apple picking, Peyton took time out to rest in the wagon and Austen took a bathroom break. Hope no one eats any of the apples off the ground! Next we went to get some apple donuts and cider. Austen devoured two and his chocolate milk. Peyton was much slower at first licking her donut and then deciding she liked it, devoured it - only to realize she put too much in her mouth and spit out a good majority of it. Next up was the cow ride (basically a little train that looks like a cow pulled by a tractor). Peyton wanted to ride it by herself and was so happy and squealing with delight before the tractor took off. After, all we could hear was her crying. We had to intercept the ride to get her back. Next ride, she was more than happy to sit with me on the ride and telling me,"More! More!" 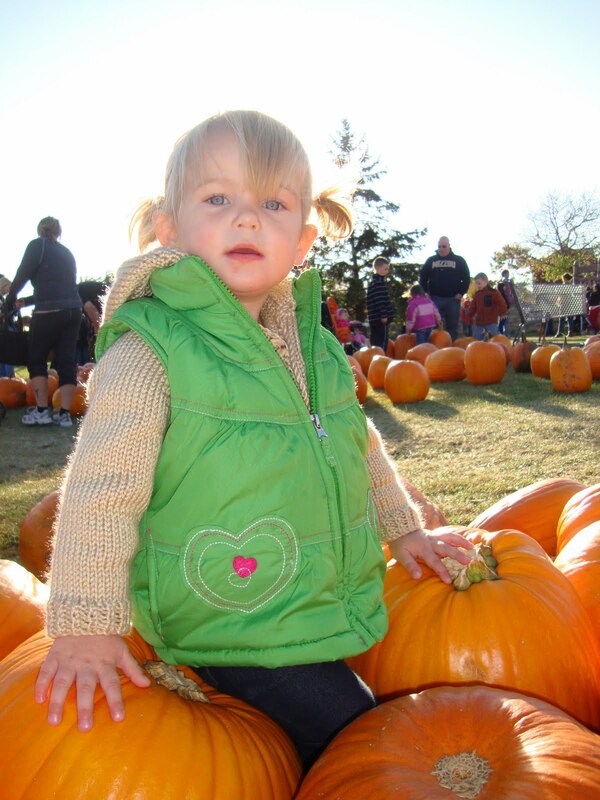 Next up, the pumpkin farm! This Fall, Austen and Peyton are enrolled in soccer. We decided it was time to get Peyton involved in an extracurricular activity since we had been doing a weekend activity such as music, gym class, basketball, baseball or soccer since he was 4 months old. We waited until Peyton was almost 21 months but I guess that's what happens with the second - you don't get them involved as early. I think with the first, the activity is more for the parents than for the kid! Anyway, Austen and Peyton play at the same time on indoor fields that back up to each other. Austen plays in a 4/5 class/league so they work on drills for about 20 minutes and scrimmage for about 25 minutes. He loves to run and chase the ball and has scored a number of goals. Lucky they haven't been own goals since he routinely kicks the ball to the nearest goal. We have to work on which goal is his! Peyton's soccer is a little soccer, bubbles, parachutes and games of red light, green light. At first she wasn't so sure but now she seems to really enjoy it. She especially likes sitting in the middle of the parachute as the parents grasp the ends and run around in a circle. I remember that there was no way that Austen was going to sit on that parachute - he always had to be on the outside. Anyway, I'm glad they are playing soccer. Austen seems way more into it now than he was when he was 3. But it's still too early to tell if either of them will be a soccer player.